Eleven people enjoyed this sunny, warm, spring day in the mountains. Brad, Dave P, Dave W, Tim and Jane were on skis, and Monika, Reinhard, Jeanne, Tim, Kathy and Dan wore snowshoes. This was a classic spring trip - icy snow in the morning that changed to soft snow in the afternoon, with warm weather and a nearly cloudless sky that caused people to lather on sunscreen and shed extra clothing layers. The lack of snow this winter was a benefit when it came to parking - we drove over the bridge to the Temple Fork parking area, avoiding the need to park at Blind Hollow and walk 1/4 mile along the busy highway. There were deep ruts and soft snow on the bridge, but our 4-wheel and all-wheel drive vehicles had little trouble getting in and out of the area. We encountered a couple of short snow-free patches along the trail between the berm and the first footbridge - any subsequent spring travelers along this route can expect to carry their skis and snowshoes for substantial distances. 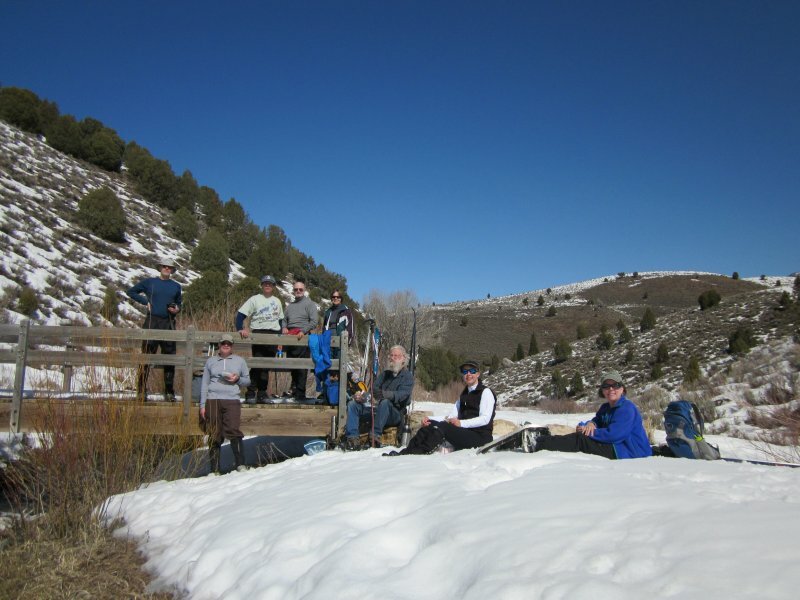 We stopped for a pleasant lunch at the first footbridge, about 1.75 miles up the trail. Four snowshoers headed back after our break, but Monika, Dan and all the skiers continued up to the second footbridge. Here, we crossed over the creek and climbed up to the Mud Flat road for our return. It is unusual for the Cache Hikers to break up into separate groups like this, but this allowed us to accommodate different expectations and abilities among the participants (the two groups kept in touch via walkie-talkie). The smaller group traveled a total of 3.5 miles with 250 feet elevation gain, while the others went 6.5 miles with nearly 500 feet of climbing. Lunch at the first footbridge, 1.75 miles up Temple Fork Creek. 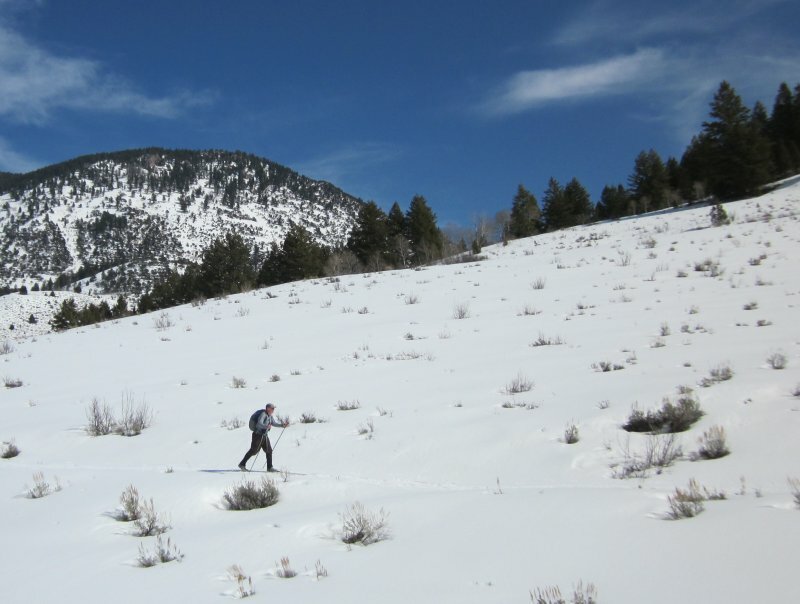 Cross-country ski touring through the open terrain above Temple Fork Creek. Some handy repair work saved Dan from 3 miles of post-holing! 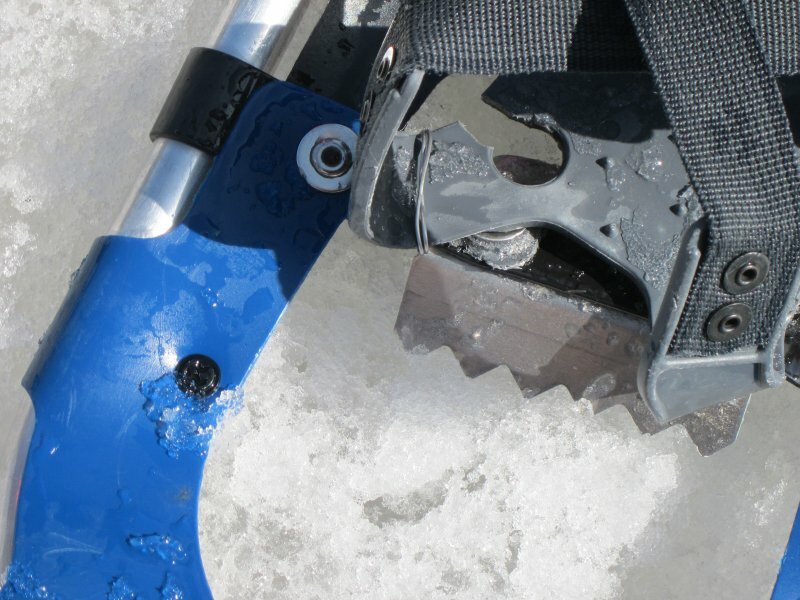 This is a GPS track for the complete trip - four snowshoers went back after the first footbridge.